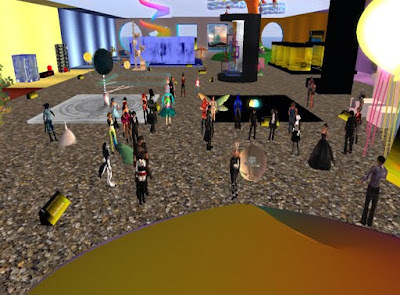 Jayjay Zifanwe gave the following speech at the Second Life 7th Birthday (SL7B) celebrations on 24 June at 6pm SLT at the Auditorium on the SL7B Upsidedown sim. The talk was attended by some 50 or so avatars. When I was asked to give a talk today, I thought of the theme of SL7B, “Unexpected Collaborations” and it hit me that it is through unexpected collaborations that the entire presence of the University of Western Australia in Second Life was set up and was developed into what it is today.... and it is through unexpected collaborations that it will continue. but it will be lifeless without the people. who have collaborated in making UWAinSL"
The theme for our build is the unexpected collaborations that have come about in the creation of the UWA presence, and that is basically what I am going to be speaking about today. In July 2007, it began with an email sent to me by then mature age computer science PhD student, and now Physics Honourary Research Associate, Dr Chris Thorne, who asked me to provide server resources for a virtual space he wanted to create. He had no idea of the ‘location’ he wanted to create, and so I said I would try to raise some small amount of funds, if the virtual space he tried to create was that of Winthrop Hall clocktower, the iconic building of UWA. 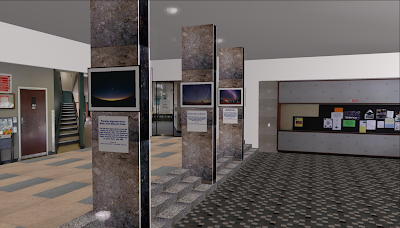 This led to the creation of the UWA Virtual Universe, on a single server at UWA, and to other members of our team who came from all walks of life; undergraduates, postgraduatess, retirees, alumni, research staff, professional staff, and interested well wishers from Thailand, the USA & Canada. This team, which included Evgeni Sergeev, Micheal Huynh, Bradley Curnow, Micheal Flynn, Minh Tran, John Robins and Wong Tzu Yen, among others. This team went on to win the Google Earth Build Your Campus in 3D Competition, were the main prize included flying us to the Asia-Pacific HQ for Google, and this carried national press coverage, as well as local, and this raised the profile of the team across the university, and put us in position to be able to raise the funds needed to make that next most important step..... the journey into Second Life. And so it was in June 2009, that the team made our first timid little steps in SL.... with the plan being, to just recreate what we could of the UWA campus, complete with its peacocks, rainbow lorikeets, ducklings in the reflecting pond, and amazing foliage in the Sunken gardens and in the Tropical Grove. Well that was our plan. But fate had some unexpected collaborations to throw at us. Two days before the first mini launch we held in August 2009, which was an RL/SL launch of an astronomy art gallery (some of it still viewable in the UWAinSL Physics building foyer) in celebration of the 2009 International Year of Astronomy, Professor Ted Snell, RL Director of the Cultural Precinct at UWA, approached me and asked me what I could do for art in Second Life. At that point I did not know a thing about art in SL, had not visited a single art gallery at all, and had not given a thought to it until that moment. So I told him.. yes, we can run a year- long art and architecture competition. Not knowing at the time that one year in RL is equivalent to nearly 10 years in SL. Anyway, this first little RL/SL launch on the 15th of August 2009, was great in that the first of the angels sent from above arrived in the form of Ourania Fizgig of the University of Arizona, an experienced hand to guide the noobs through their first event. 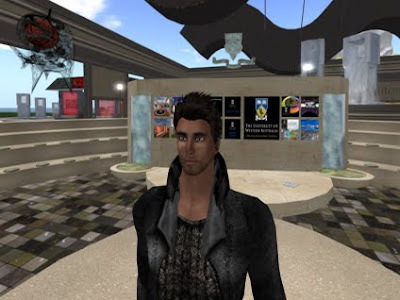 We announced the competition, and the next angel was sent in, and this was quadrapop Lane, well know art champion in SL over a number of years and alumni of UWA. I was worried about getting entries at the time, and thankfully, my instinct told me to ask her to be curator of the art challenge instead of submitting an artwork, and this has been probably the most important of the unexpected collaborations to take place. 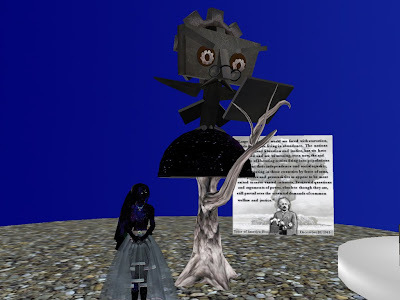 It was really great she was there as it counterbalanced some of the ‘art legends’ in SL who came and told me I was crazy to plan a year-long challenge. Jesse Keyes, among 2 dozen others sent in some wonderful works. Now 10 months on... we have had more than 600 artworks and flagship buildings sent in, and more than 165 artists and builders taking part.... and these 4 artists, have submitted works for every single round of the challenge thus far. For their support, I thank them deeply. The prize pool for the art and architecture challenges initially started with about L$100,000 and has now reached L$550,000 in all. However when we started, I wanted to acknowledge everyone who took part in some way, as opposed to only those who won the challenges. Because of this, we created the monthly artist pool and a tip jar was set up at the art platform where all the art is displayed. Whatever is contributed by the residents of SL is distributed among everyone who takes part each month. The UWA 3D Art & Design Challenge participation pool tip jar. The unexpected collaborations happened as I was describing what I was planning to a number of people, and one after another, Sasun Steinbeck, Galea Yates, Lowell Cremorne, MidnightRain Glas, Tranguloid Trefoil, Phillip Vought and Gumby Roffo all stepped in to form the bedrock of the monthly pool, each pledging to contribute L$1,000 each month, and many of them didn’t know me from adam 24 hours before they promised to do this. The RL judging panel for the monthly winners, are all based in Perth, Western Australia, some of whom had been operating in-world for a long time, some of whom had no SL experience whatsoever, but who are luminaries in the RL art & architecture fields are a very important part of how everything developed. 13. Jordan Whitt - Editor in Chief of ICON Lifestyle Magazine. When we first started, all we wanted to do was to recreate the RL University, and had no thought as to research, art or teaching. I hoped that if we did a good job creating the campus, that we might some years down the track, encourage the academic staff to use the space for teaching. But as serendipity would have it, 2 weeks after we got into SL, I saw a girl riding a bicycle on UWA land, and she told me she was a student in RL at UWA. Through her, I found out that her lecturer Professor Wade Halvorson for the Electronic Communications Strategy Unit, which is a 2nd year Bachelor of Commerce Unit in the School of Business was trying to use SL for this unit. He had no idea anyone else in the Uni was using SL. We immediately started working together and we built the UWA sky theatre as his primary venue for teaching, and through this we managed to bring in many notable lecturers from overseas to teach UWA students through SL. Jayjay and tour members in the UWA Skytheatre, built by Moth Rexen. The 3D Art Challenge also led to the setting up of the Artist Book Prize. This was done in collaboration with Juanita Deharo who owns the Second Edition group and with support from Intelli & The Book factory. An artist's book is an artwork in a book format, or an artwork which has its origin in the form or concept of the book. educator and collector of new media art as well as Victor Vezina, a journalist who writes weekly column on digital toys and virtual worlds for Guardian newspaper, London. 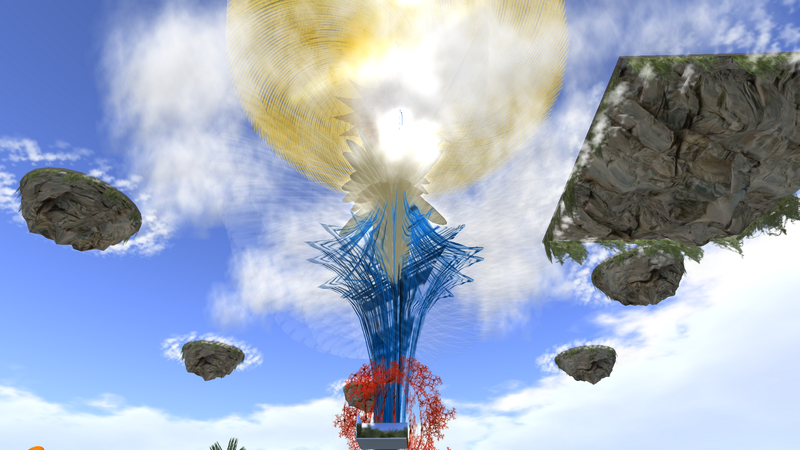 The next angel sent to us in our journey was White Lebed, who has led the Art Deptartment at Burning Life so admirably. Without her, the event most responsible for helping UWA break the RL/SL barrier would not have happened. White Lebed in the audience at the SL7B Auditorium during Jayjay's speech. Starting with a humble prize pool of L$10,000, this bubbles up to L$220,000 by the time the winners were announced with thanks to The Casey Family of Western Australia, John Stubbs (UWA Director of Student Services), Dr Chris Thorne (RL), Philip Vought (SL), MidnightRain Glas (SL), and a secret benefactor who had a lot to do with SL7B. 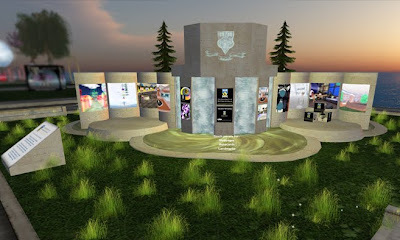 The challenge set in December 2009 was to "create a Machinima that captures the four main elements that make up the heart of the University of Western Australia in SL. These elements are the architecture, the teaching, the research and Arts." Because of all the good news and publicity surrounding the Machinima contest and the 3D Art & Design Challenges we managed to receive confirmed funding for the Arts & Machinima for a further 3 years following the end of this current cycle in August 2010. The funding allows us to provide L$1,000,000 per year for Art Challenges and L$500,000 for Machinima for each of the next 3 years. And this time especially for the Machinima, we will have far greater freedom of topic, and in fact I welcome ideas as to what can be done for both the art & machinima. Its truly amazing to us, that across all the activities we carry out in SL, we have people engaged from so many parts of the world. I normally announce during the monthly winners event at UWA for the 3D Art & Design Challenges, that we have artists from 6 of the 7 continents in the world taking part, and offering a special prize to any artist from Antarctica who takes part which will help us circumnavigate the whole world! The countries people have come from include Wales, Canada, the USA, the UK, Uruguay, Scotland, England, Spain, Switzerland, Italy, France, Brazil, Chile, Denmark, Holland, Ireland, Portugal, Austria, Cuba, Serbia, Tunisia, Singapore, Germany, Japan, New Zealand and Australia. Almost all of them qualified for the world cup! To the Casey Family of Western Australia who heard of the UWA 3D Art challenge, we thank them for helping to establish the Casey West Australian Cultural Prize (CWACP). This was established to encourage the seeking of knowledge about Western Australia (WA), its culture and its people through the 3D Art & Design Challenges . We are learning and sharing much of other cultures and viewpoints at UWA through these Challenges and the CWACP was established to encourage that mutual flow of learning. One of the five sims that make up the UWA presence is UWA Virtlantis, which is a partnership with Kip Yellowjacket & Second Life English. This sim features what’s probably the tallest structure currently existing in Second Life, DanCoyote Antonelli's Tower of Light. 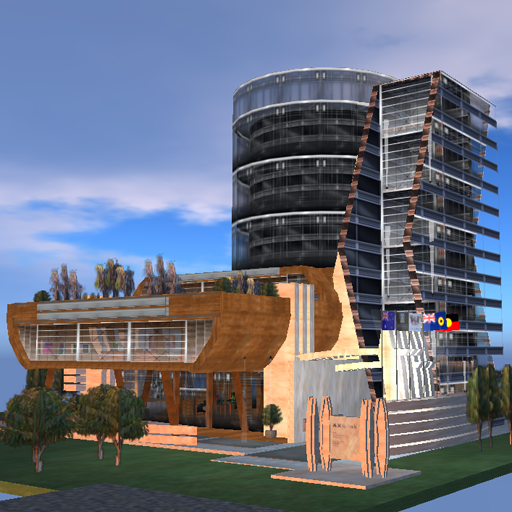 The Tower is symbolic as an anti-tower of Babel, as the aim of this sim is to bring together people and cultures from all around the world for language exchange and learning. For the Virtual Mooting Court we have teamed up with the University of Western Sydney through one of their law professors, known in Sl as PaulRogers Actor. 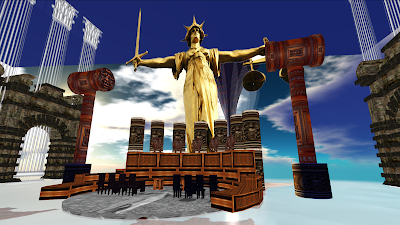 To conduct national and international moots at a wonderful moot court built in SL, by Nyx Breen who is an amazing creator, and built in front of my eyes, UWA’s beautiful and iconic Morton Bay fig tree (which I had been trying to have replicated in the virtual world for 2 years). Mooting Court on UWA Winthrop - built by Nyx Breen. We are continuing discussions with PaulRogers to have a fully fledged international virtual moot court, replacing some of the teleconferencing methods used by some institutions at present to carry out this activity. Well given the happenings of the last 24 hours, what I had intended to say, turns out to be a tribute now. Anyway, I will say the words as I had intended. One of the guilty pleasures I have had in SL is getting to know the Big Kahuna of Second Life, CEO of Linden Labs, M Linden, aka Mark Kingdon. The first time I heard of him was when quadrapop excitedly told me that the CEO of Linden Labs was visiting our sim. M later tweeted that he really liked what he saw at UWA. Well taking this cue, I invited him to be a judge for the Grand Prize round of the UWA 3D Art & Design Challenge, and was thrilled when he accepted. 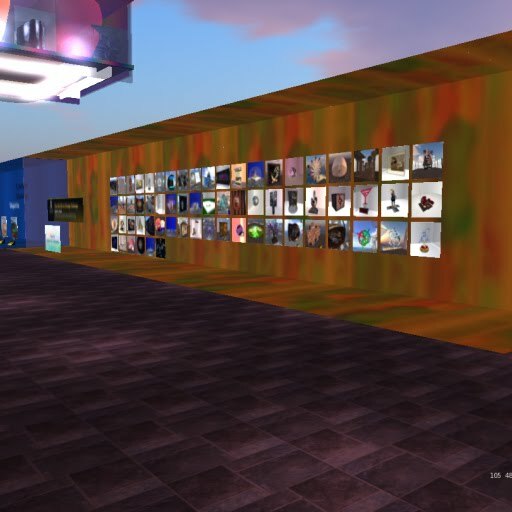 A month or two later, thanks to White Lebed, we managed to put together a RL/SL Art Show called 'Doodle Art', the personal art show of the CEO of Linden Labs, the first time his work had been seen in this way anywhere in the world (real or virtual). This happened thanks to many people. First of all, White Lebed, curator of the show, whose dynamic work behind the scenes made all of it possible! The Slingshot and Nyx Breen for creating a replica of the RL Lawrence Wilson Art Gallery, a famed art space in Western Australia and Chantal Harvey & Larkworthy Antfarm for their breathtaking machinima. Hosting the RL side of things was award winning West Australian artist Len Zuks, who collaborated with Miso Susanowa (SL) who breathed a fresh second life into his sculptures, 'Megabyte' and 'Lil Eizenstein', in a first ever RL/SL collaboration between American and West Australian artists. His RL sculptures stood alongside M Lindens RL works as he officially declared the RL exhibition open! The first time Len saw M's work, he said: "It is not 10 minutes since my eyes first beheld an image of one of Mark Kingdon's artworks. I had been in discussion with Jayjay for several weeks on this anticipatory moment. If I had seen any other style of illustration, it would have been of a lesser impact. The unexpected image and the subsequent revealing insights was an unequivocal surprise. It is as if I had bypassed the artist's eyes and had a glimpse into the mechanism of the artist's mind. Wow! " Important international collaborations have also been set up, with Dr Carmen Fies and The University of Texas San Antonio. This collaboration also started through the UWA 3D Art & Design challenge. The initial exchanges and collaborations between us has led to a Memorandum of Understanding (MOU) being signed in RL as to our SL collaboration and benchmarking, and we are very pleased that this MOU is being signed by Dr Romo, President of the University of Texas and Professor Alan Robson, the Vice-Chancellor of the University of Western Australia. The launch of the 200 seat UWA-BOSL Amphitheatre is another major collaboration. Built by Patch Thibaud, this beautiful venue was been set up jointly by Frolic Mills CEO of Best of Second Life (BOSL) and the University of Western Australia (UWA) as a space dedicated for non-for-profit Art, Education & Charity events. This is part of UWA's and BOSL's aims of community service and support of Education and Arts. 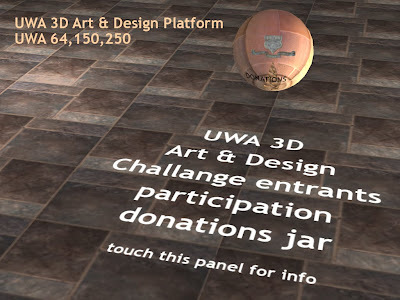 Phillip Vought is the founding Patron of the Theatre and also has been and continues to be a major benefactor to the UWA 3D Art & Design Challenge. I must also mention Mankind Tracer the amazing, multi-award winning musician who launched SL7B, who was also the first performer to break in the UWA-BOSL amphitheatre! Another amazing partnership has been with Second Physics, SL Art and Experience Italy for the Science & Art Physics competition creating 3D pieces inspired by Physics across a number of Physics categories including Atom, Big Bang, Cosmic Rays, Electricity, Nanotechnology and String Theory. The Competition aims were create artworks that communicate scientific concepts, with this first edition devoted to Physics. This is very close to my heart as in RL, I work at the School of Physics at UWA. Majorie Fargis was our main collaborator in this as was Professor Franco Fabbri (RL), a Visiting Scientist at CERN who works on elementary particles. The UWA 3D Art & Design Imagine Challenge has a People's Choice Award where all the residents of Second Life can nominate their favourite pieces each month. The vote board is open from the last day of the month till just before the monthly winners announcement - at least a 7 day period. Please do keep an eye on the UWAin SL blog, or join the UWA 3D Artists group (both inworld and subscribo groups joiners here) to find keep up to date on when to vote and other events at UWA. For the June round of the challenge People's Choice will run from 1 July , and I hope everyone present today will go and vote. UWA had been providing the prizes until the wonderful Residents of Artemisia, through FreeWee Ling stepped in to sponsor the People's Choice Award. In the words of FreeWee, "Artemisia is a residential sim of which I am the owner. 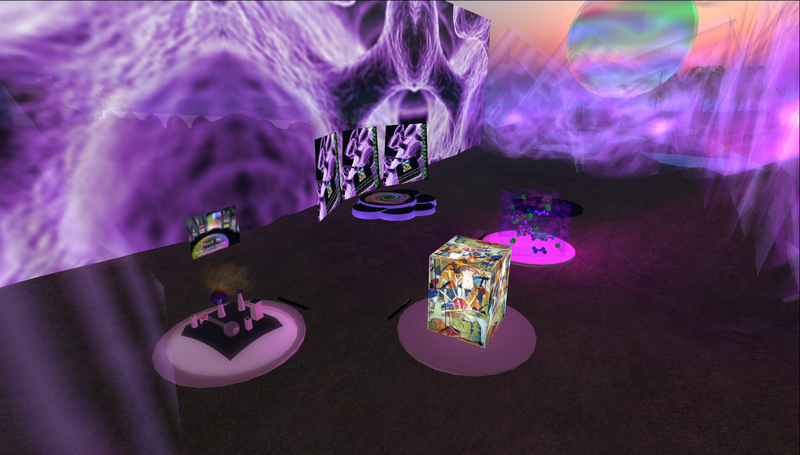 I inherited the island from a dear and generous art patron who had to leave SL for personal reasons two years ago. Her founding principle was to provide a place for creative people to find and create inspirational work. Since the sim was a gift, I have always tried to remember and build on her generosity with a fundamental mission of service to art. The UWA Imagine Challenge's People's Choice Award is wholly in keeping with the spirit of our community. " 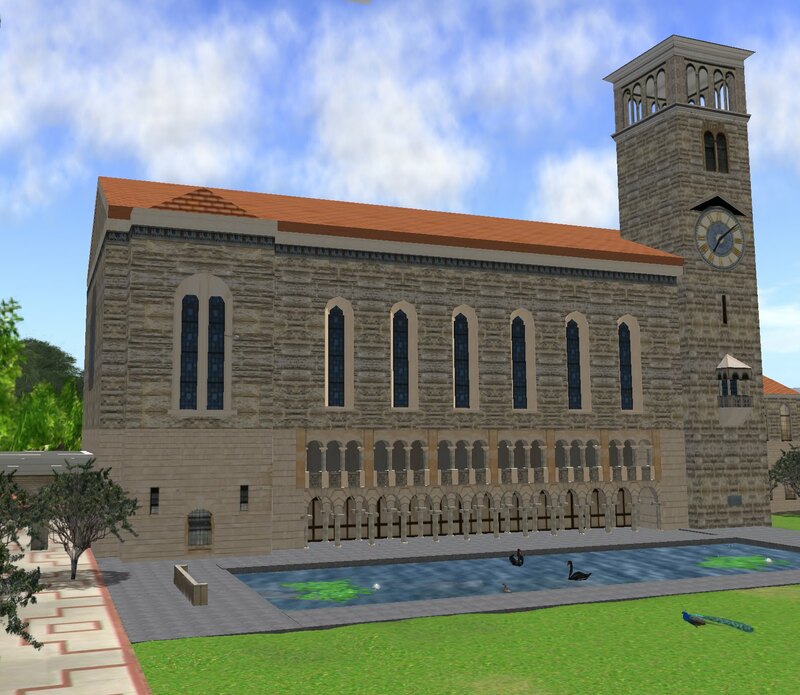 "The judges felt that UWA is one of the prolific and active educational facilities incorporating all of Second Life residents into it's agenda, not just their own, private student body. You have already created platforms and creative competitions for Machinimists and under one roof have included many independent Artists In Residence - which is something very few other facilities of this type have considered doing. Other higher educational facilities have planted themselves on an island and build walls to keep the rest of the virtual world out as where UWA has consistently invited them in"
Another collaboration was the teaming up of 2 of the Linden Prize finalists, UWA & Archivist Lewellyn (of the National Space Society) for The National Space Society's 'NSS in SL' machinima contest exhibition showing and award ceremony, which celebrates the mission of the NSS for space exploration and the technical and artistic expertise of machinima artists, with the winner walking away with a L$100,000 prize. 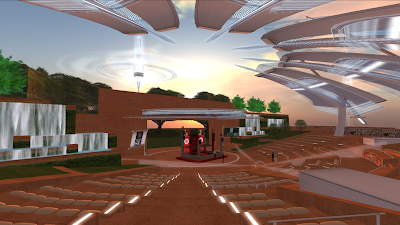 This took place at the UWA-BOSL Amphitheater on the 12th of June 2010, with thanks to Theatre Director Taralyn Gravois and the wonders of the scripting magician LaPiscean Liberty. This partnership is another exercise in serendipity as the NSS Machinima event was inspired by UWA's own Machinima Challenge. There seems to have been so many people mentioned already, but I have to apologize now, as I know I have missed out many many more. 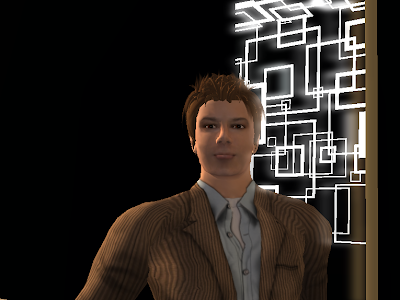 From UWA and from myself I say thank you to all the wondrous avatars of Second Life for these unexpected collaborations, and I know that these will keep happening and continuing to amaze us all! Awesome speech, Jayjay!! What a journey.